Its not every day you get handed the keys to the latest model of a car with close to delivery miles on it and told to "have some fun", luckily for me those were the words given to me alongside the keys by Bristol Street motors in Northampton. The Nissan dealership had this Juke RS in and were game for me to give it a test. 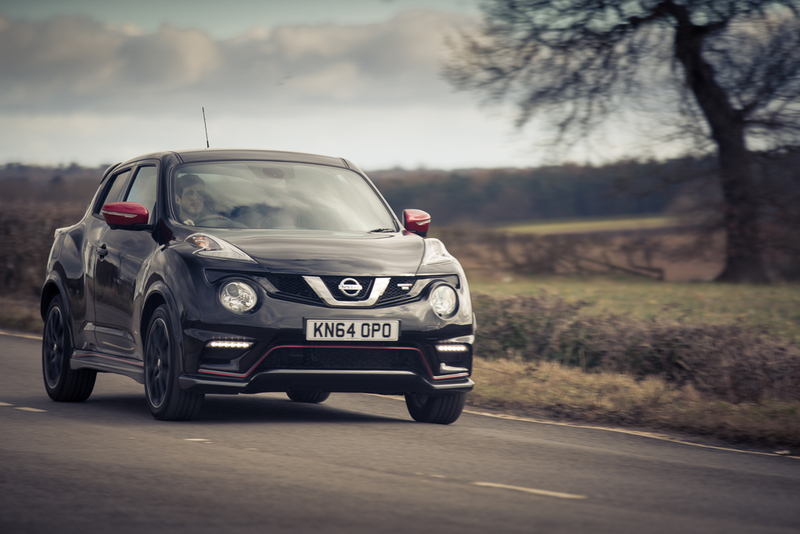 The RS is Nissans answer to the hot hatch, stepping away from the usual hunkered down low cars you usually find in this category they started with the Juke crossover and added some stiffer suspension, 37% extra downforce and some key styling alongside the 1.6 litre petrol turbo engine. The Juke RS next to its little brother. The more aggressive styling and the red accent colour throughout the interior and exterior set the RS apart from its more family orientated little brother. This aggressive stance carries through to the firmer ride and extra bit of power that carries this car through the twisty corners of our local B roads. When you first see the interior of the Juke RS you see the race car inspiration straight away, the Nismo printed Recaro seats taking pride of place ready to hug you and support you round each bend, the carbon fibre paddle shift and the red dials again imprinted with the Nismo logo to remind you of where you are. There is a Boost and Gforce dial as part of the entertainment system (and it did entertain as we watched the playstation like graphics dance around the screen), The alcantara steering wheel reenforces that racing pedigree. We did find the car a lot more fun with the 4x4 turned off, putting all the power into the rear wheels and pressing the mode button until it read sport. This does lower your eco points (as given on one of the screens) but when your outside one of the worlds finest racetracks you tend not to concentrate on the Eco, and look more for the next excuse to drive. With thanks to Alex Collins for driving the Juke RS when needed, and to Bristol Street motors for supplying the car.